I like things that can be used in more than one way. Each summer I make a supply of calendula salve. (I posted here how to do it) This cream comes in handy for scrapes, bug bites, and all kinds of other things. In the winter it gets put to use in a different way. A scoop of salve mixed with either a drop or two of eucalyptus or oregano oil makes for a good chest rub when your child has congestion in his chest. It's an earth-friendly substitute for certain petroleum-based products. You might find it a little bit oily, it is almost 100% olive oil, but I could show you how to make a different kind, one that is not so oily. Or you could just put something like this on at bedtime and let it soak in at night. 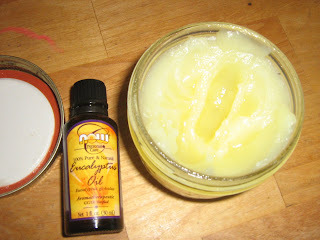 If there is a not so oily kind, I'd love to learn to make it. Thanks Heather!